Benefits: Using advanced technology, this ultra light, shimmer non greasy Blemish Balm is an unique cream which can transform and blend its own color to different skin tones without clogging the pores, leaving a silky, radiant, flawless and natural looking coverage skin. Skin is instantly hydrates, firmer, brighter and protected from free radical with a high sun protection SPF50. Usage: Apply adequate amount on face and neck with fingertips using upwards movement. Apply by itself or before powder foundation. 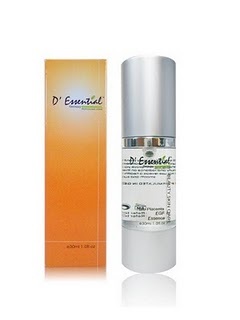 To provide nutrients and supplement to help in accelerating cells metabolism and stimulating synthesis of collagen. Effectively defend and reduce ageing lines, repair skin damages by free radicals, tighten and firm the skin. 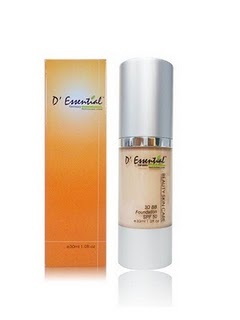 Skin is smooth and moist; skin brightness is restores and appearance of spots is reduces. Apply adequate amount on face and neck, massage in circular movement for better penetration after cleansing and toning. For better results, apply day and night, follow by D’essential moisturizer. Benefits: Using enriched powerful bio-active ingredients and Bulgaria purest May Rose essential oil, it targets specifically on fine lines, wrinkles, sagging skin, dilated pores, dull, pigment & uneven skin color. It effectively strengthens & improves skin elasticity, refines skin contour and texture for a fairer and smoother skin . It locks its moisture in to hydrate, nourish, repair & increase its cell renewal & balance skin pH at healthy level, leaving skin radiant & flawless. Directions: After cleansing and toning, apply adequate amount on face and neck, massage in circular movement for better penetration. For better results, apply day and night.